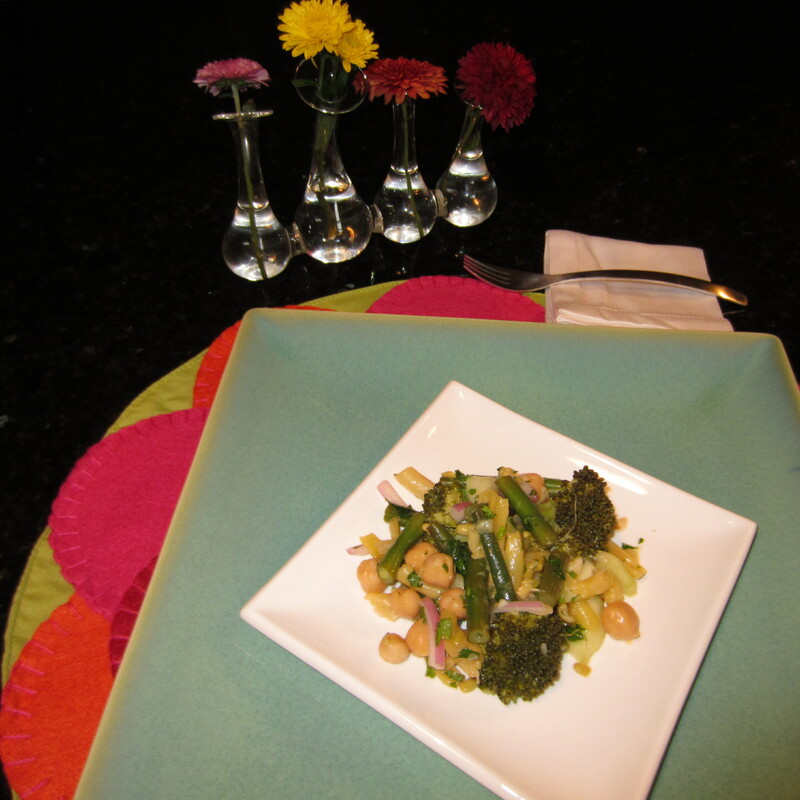 Earlier this week I posted a recipe for a Mixed Bean Salad Ala Carte. This is a slightly different take on that same recipe that excludes the kidney beans and red peppers. My daughter is not a big fan of either and since she is back on the Blimpy Girl eating plan, I am trying to make dishes she will enjoy. I swapped our yellow waxed beans for the kidney beans and cucumbers for the red bell pepper. The dressing is minus the juice of the oranges and 2 teaspoons of Girard’s Raspberry dressing was used instead. Fresh parsley is a key ingredient. 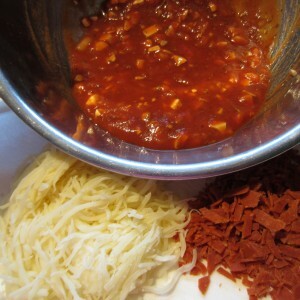 This is a shared, somewhat revised, recipe from my good friend Wendy at RealFoodTips.com. If she says this is good, you can trust it is good. She’s an awesome gardener and advocate of cooking “real food”. Thanks Wendy for sharing your source and revisions. I can’t wait to try this. I whipped up this bean salad for lunches this week. One cup=125 calories. Can’t beat that! If you’re on a slippery slope to weight loss. My “lifestyle” eating plan includes 5 small meals a day. Almost no sugar, very lean meats and plenty of veggies. Skipping meals is a no-no for me. You can’t burn fat if you aren’t feeding the body. Who needs bread when you can have lettuce? A perfect wrap for this steak sandwich. Who needs the calories of bread or a sub bun when you can use lettuce as the sandwich wrap? This cheesy steak sandwich smothered with onions and mushrooms is a low cal lunch that can be prepared in under 10 minutes. 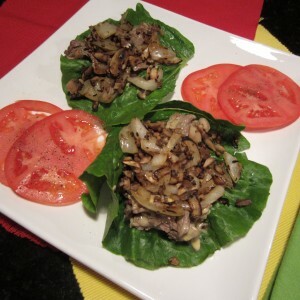 One lettuce wrap with two tomato slices is in the neighborhood of 200 calories. I used 2 ounces of lean tenderloin thinly sliced and quickly pan seared. This is an “on the fly” lunch and can be prepared ahead of time. Reheat the meat mixture on the stove top and then plate on the lettuce leaf. I used Boston leaf lettuce for my wrap, but you can also use red, green or romaine leaves as well. Use a cloth tablecloth. I personally prefer white linen tablecloths because because it complements just about any color scheme you elect to use for your table setting. 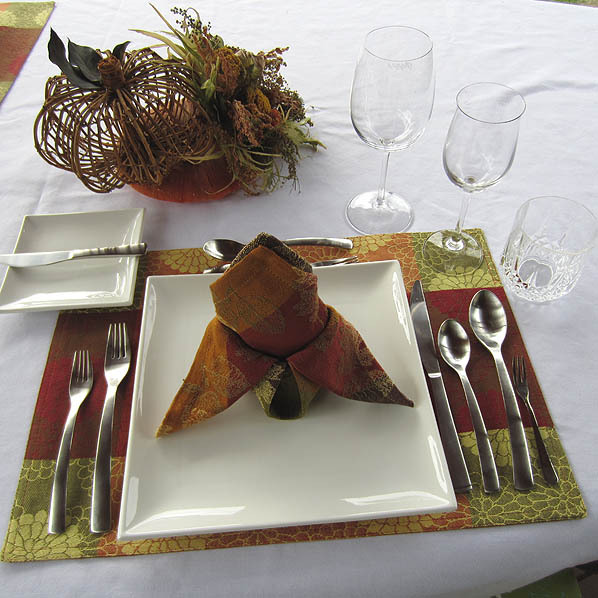 However, you will note in the above photo that an autumn color tablecloth was used as it was a perfect background for the Fall theme of the table setting. Unless you are camping or having a picnic at the playground, DO NOT use plastic tablecloths. Silverware is placed in the order it will be used. Start with the salad fork (if serving salad), then the dinner fork. These are placed to the left of the plate. Knifes and spoons go to the right and the knife blade should be pointed toward the plate. If serving dessert, the dessert utensil goes above the plate. I could get real techie here about which direction the spoon, fork, or knife should go, but I won’t. If you get the dessert utensil above the plate, we’ll call it good. You can also just bring out the dessert utensils when serving dessert. It’s your call. I’ve done it both ways and it generally depends on what I’m serving and how large of a group I’m entertaining. As you will note in the (L) photo, I have placed the fork and knife on the left side of the plate. Generally, a no-no but it works in this informal setting and no one is going to shoot you dead for it. 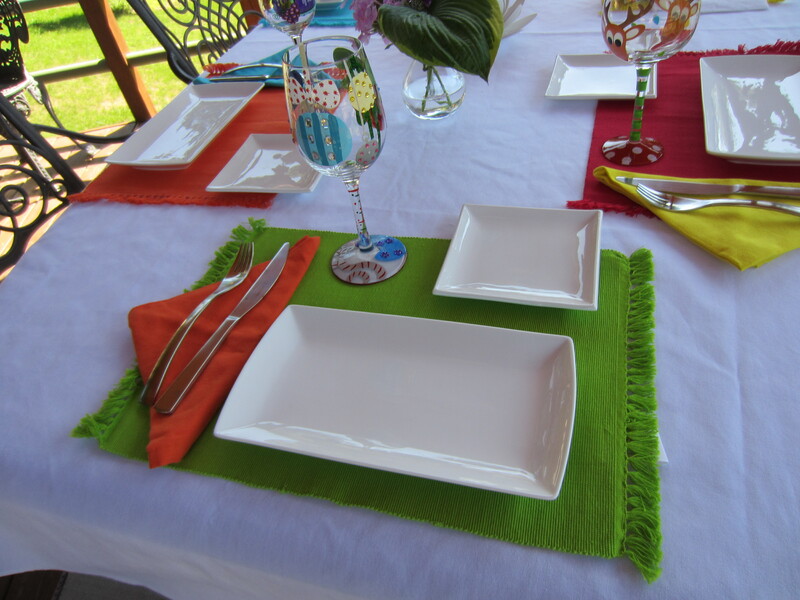 The dessert plate is positioned where the glassware would normally be situated. I wouldn’t do this for a formal dinner party, but in an informal setting it is about eye appeal. If it works, go for it! It's all about plating your food. It starts with great, fun dinnerware. If I’ve said it once, I’ll say it 100 times. If you artistically plate your food, it will be perceived as yummy. A concept that anyone new to cooking should understand. Part of serving food is presentation. That is lesson 101 in six words. The food you present should appeal to ALL your senses. This means nose, eyes and mouth. You don’t have to be a culinary specialist to learn how to plate food. You just need the right tools and the willingness to learn how to present your food in an attractive way. Here are a few pointers to help you get started. Choose plates that will complement your food. For me, that is white. 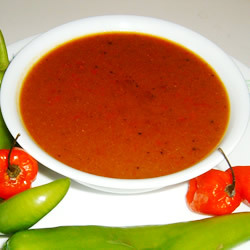 Nothing shows off a sauce or a colorful food palette like white dishes. Make sure the plate size fits the portion sized being served. 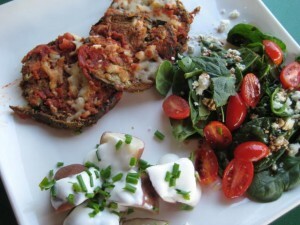 Don’t use a large dinner plate to serve a small salad. The salad will look pathetic when overpowered by too much white space. 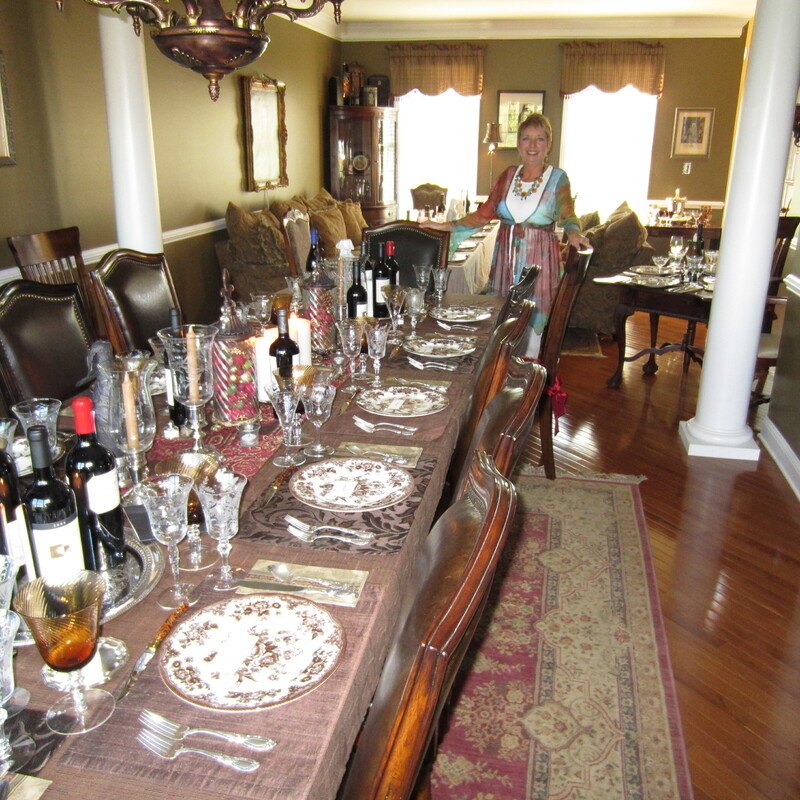 Learn table setting etiquette. The short version, learn how to set a table properly. 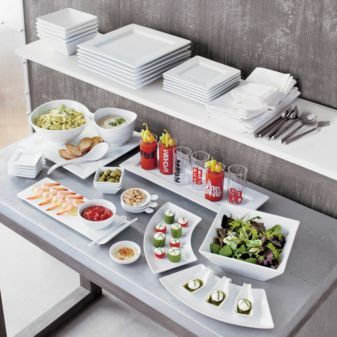 Know where the salad forks go, which side to place water glasses, salad plates and dessert utensils. I will be doing an upcoming post that covers all these basics. If serving a hot dish, make sure the dish/plate is hot. The same is true of cold dishes. 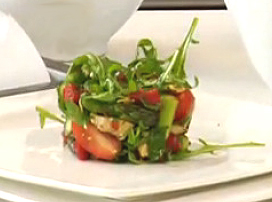 If serving a side salad, briefly chill the dishes in the fridge or freezer before plating. Varying heights can add interest to your plates. If you have a mound of mashed potatoes (which by the way, I suggest you use an ice cream scoop to make your potato mounds) then plate the meat so that it slightly overlaps the taters. The veggies could be fanned out at a lower level. Don’t be afraid to play with the food. Arrange, play with it, arrange, play with it. You can always reheat the food before serving to ensure you’re not wasting any portions. 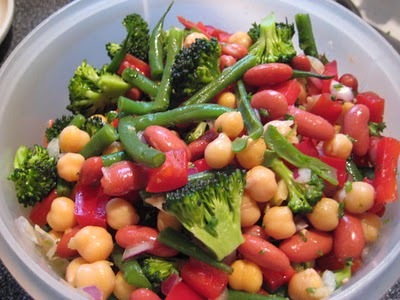 As shown below, this salad was placed inside a tin can (top and bottom removed). The salad was stuffed and packed in the can and then the can removed. Look at the nice height. Who said salad couldn't have some height? Pair color and texture. If you’re serving a zucchini soap which is mainly green in color, then pair it with something red, like minced red peppers. Sprinkle on top of the soup for a splash of color. Crumble low-fat feta on top of a steak. Color and texture add interest when plating your meal. The oddball wins the prize. Consider plating in odd sizes. If you have 6 shrimp per guest, plate 5. Why? It adds interest. Always garnish. A leaf of romaine, a lemon wedge, a side of parsley, an apple or tomato wedge. It should always be edible, colorful and functional. Remember, you eat with your eyes. 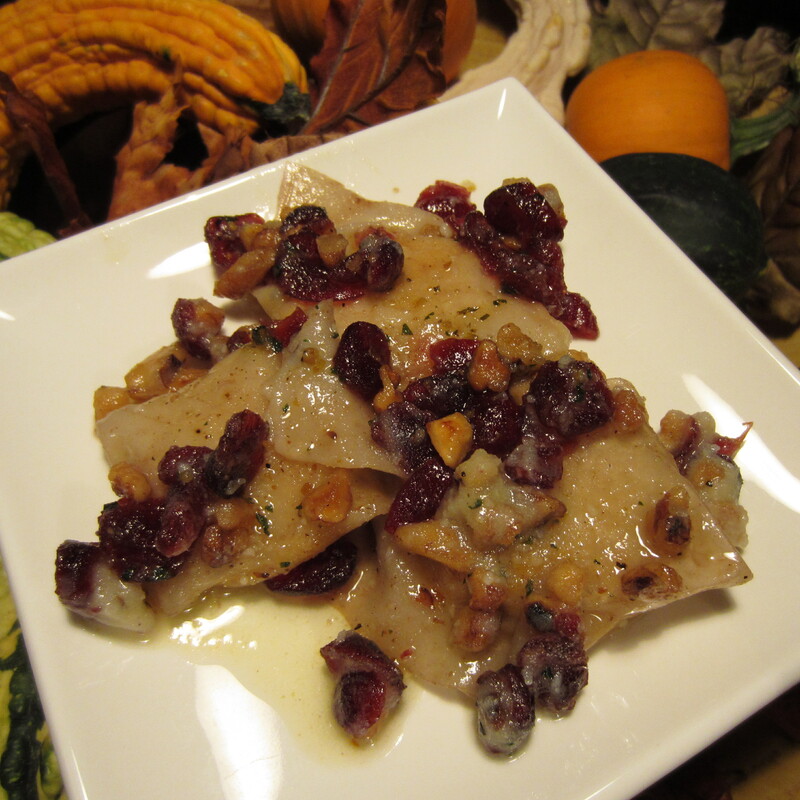 If the plated food looks yummy, your guest will believe it’s yummy. Put that little extra effort into making your meals looks like you put some thought into what is being served. Finally, if you’re looking for a great starting point for finding fun and creative serving dishes. Start here CB2. This is one of my all-time favorite places to shop online for dinnerware, linens and serving dishes. Whole wheat noodles give some fiber punch. What a perfect Fall dinner. Beef stroganoff with whole wheat rotini. 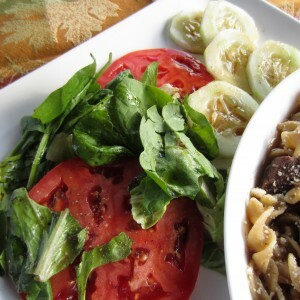 The mixed green side salad with garden fresh tomato & cucumber slices where just an added perk. Initially, this may seem over the top in calories. Not so! 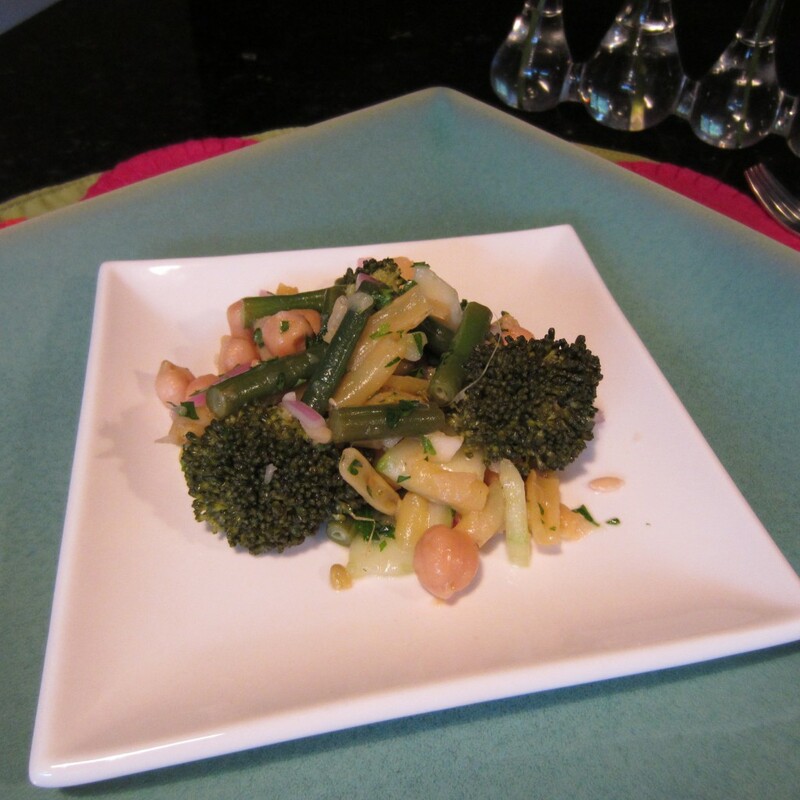 A 1/2 cup serving of cooked noodles (as pictured) is only 150 calories. 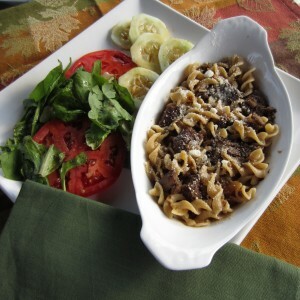 Topped off with 2/3 cups of the stroganoff, you’re only adding another 190 calories. Come on, now… 340 calories for this deliciousness. I sprinkled grated Parmesan cheese over the dish for added flavor though it wasn’t necessary. A teaspoon of the cheese was a 10 calorie indulgence. 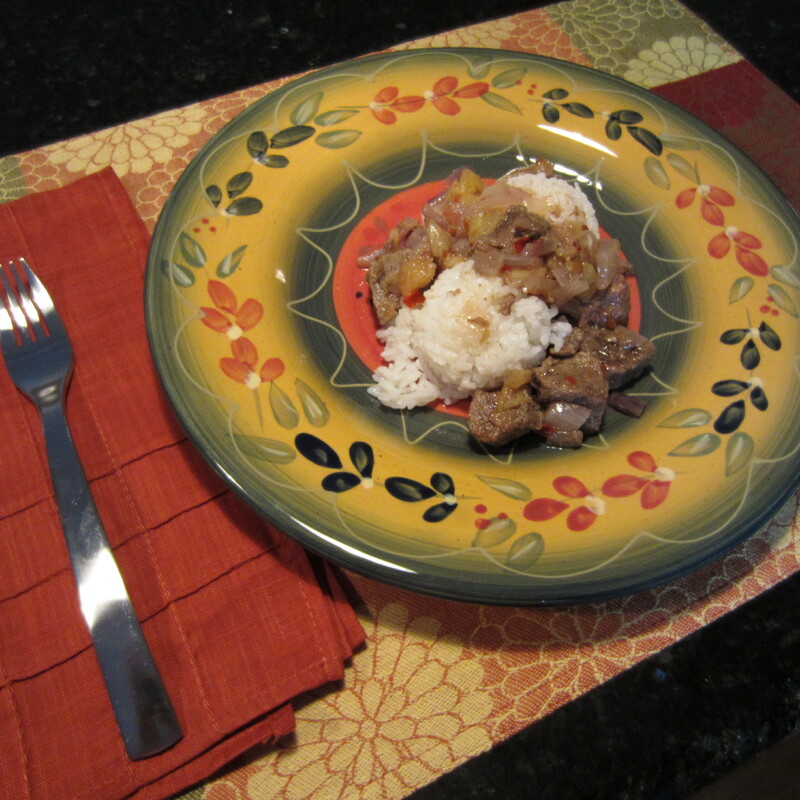 Onions and dehydrated mushrooms were the only addition to the stroganoff. The broth was made with roasted beef base. A dollop of low-fat sour cream…. hmmm… add 30 calories. Mixed green salad drizzled in balsamic vinegar and olive oil. I love all bell peppers… red, yellow, orange and green. This is a recipe that has my name all over it. 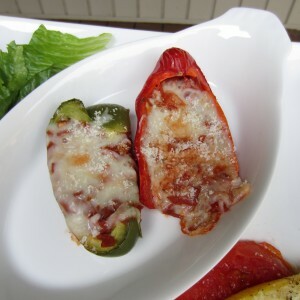 Pizza slices using bell peppers as the crust. Sadly, this isn’t even a dish I could share as my husband is not a fan of green peppers and my daughter doesn’t like red peppers. Geez, guess that means I’ll be having double portions. I snagged two of these slices for lunch along with a side dish of oven roasted summer squash with onion and pan seared tomato slices. The entire plated dish was around 170 calories. Two peppers made 12 pizza slices. It’s best served hot but I’ll have to see what it takes to reheat for lunch tomorrow. I don’t usually eat leftovers, but this might be an exception. Mozzarella cheese (fat-free, of course), turkey pepperoni and seasoned tomato sauce are the perfect combination for these pizza slices. 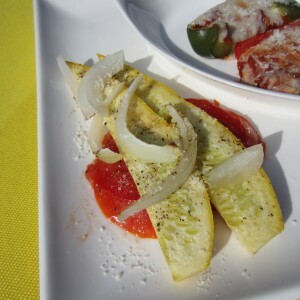 Grilled tomato slices, baked summer squash & onion are a perfect side dish. Now this dish has a little kick. Pepper flakes give it some zip. It’s then toned down a bit with pineapple bits and sweet Asian chili sauce. This can be served up as either an appetizer or over rice. 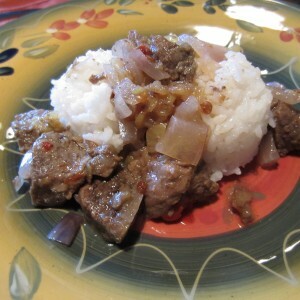 I elected to have it over sticky white rice. But, if using as an app, simply insert a toothpick into each bite size morsel and serve hot on a platter. You can kick this up a notch by adding additional red pepper.